Humphrey Spender photographed the bowling competition at The Gibraltar Rock pub on Deane Road on 20 August 1937. 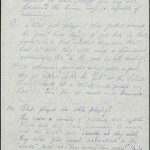 Another mass observer made a written report of the same competition. 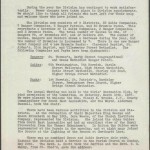 The annual report of the Bolton Division Girl Guides describes their activities in 1937. The description of their local Coronation rally on 25 Spetember 1937 helped us to identify Humphrey Spender’s photographs of the event. 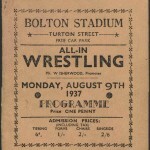 Mass Observation were interested in the popularity of All-in-Wrestling in Bolton. Humphrey Spender photographed the rounders cup challenge between Tootals and Eagley Mills on the 11th August 1937. Observer PJ made a 12 page report on the same game which recorded the behaviour of the players and spectators. Humphrey Spender photographed a quack medicine stall in Bolton Market on Thursday 23rd September 1937. 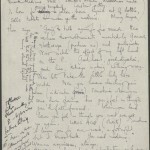 He also wrote an observation of the stall. 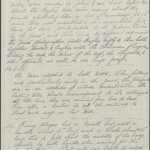 His comments add rich detail to the sequence of photographs. They also provide factual information so we can date the photographs and others on the same film. Humphrey Spender photographed a performance of Madame Butterfly at the Grand Theatre, Bolton on Wednesday 22nd September. 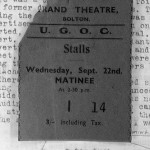 We can date the photographs by the written observation he made of the matinee.